During Career Readiness Days students can take advantage of workshops, skill building sessions, resume reviews, mock interview activities and other events designed to assist students and job seekers with career and college transfer preparation. Thanks to all of the presenters and students who turned out for the Spring Quarter 2016 Career Readiness Day! We appreciate your participation in advancing our mission of “career placement and enhancement” to benefit our students. Anthony Partridge is based in the Cayman Islands where he is senior counsel in the Global Trust Group of Walkers. Anthony specializes in all aspects of non-contentious private trust matters, cross-border succession matters and has particular expertise in resealing foreign grants in the Grand Court of the Cayman Islands. and on-shore counsel in relation to applications to reseal foreign grants of probate and letters of administration in deceased estates, as well as drafting wills specifically tailored for assets located in the Cayman Islands. Dianne Conolly is certified trainer with significant expertise in Human Capital Development, holds a Master’s Degree in Public Policy and Management, and is a certified trainer and member of the American Society for Training and Development. Ms Conolly joined the NWDA in 2014 and currently manages the NWDA’s Training and Development Unit where she is responsible for managing several initiatives such as the National Training Programme, the National Apprenticeship Programme, the National Mentorship Programme and the National Internship Programme. Ms. McKenzie-Cahill is Vice President of Marketing for Cayman Enterprise City and has been involved with the project since its inception in March 2011. She is responsible for the strategic development and implementation of CEC’s international marketing, communications, lead generation and business development. Ms. McKenzie-Cahill brings 25+ years of marketing and business development experience to the project and has called Cayman home for the past 22 years. Hilary has held several senior level management roles during her tenure in Cayman, with either Caribbean regional or global responsibility. Hilary is a serial entrepreneur and investor in several businesses in Cayman and prior to arriving here was a founding partner of a highly successful European development group that marketed master-planned developments throughout Spain and Germany. She studied E-Commerce with UCLA and went on to become one of Cayman’s first Internet entrepreneurs as co-founder of www.ecaytrade.com and www.ecayonline.com. Simon Garnett brings almost 30 years’ experience to his current role as the Chief Financial Officer of Sackville Bank here in the Cayman Islands. He had previously been Head of Finance for Cayman National Trust Company, and later, Group Head of Internal Audit for Cayman National Corporation. Before then, he spent eight years with RBC Wealth Management in Cayman, where he was Regional Head of Finance for the Caribbean. Simon qualified as a Certified Accountant in the UK in 1994 and was admitted to membership in early 1996. 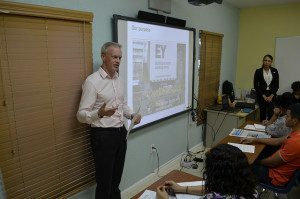 He is a member of the Cayman Islands Society of Professional Accountants and former chair of the Cayman Islands Chamber of Commerce’s Leadership Cayman Programme. Natasha Playne is a Fellow Chartered Accountant (FCA) and a Fellow of the Australian Institute of Company Directors (FAICD). She graduated in 1986 from the Queensland University of Technology with a Bachelor of Business majoring in accounting and a minor in computer programming. Natasha has over 30 years of accounting experience, including being a partner in a forensic accounting practice in the UK and Australia, a few years as a CFO and many years as an educator and trainer. Natasha has been in Cayman for four years. She volunteers at the National Workforce Development Agency teaching job seekers accounting and bookkeeping. She also volunteers with CISPA and is chair of CISPA’s Careers & Mentoring sub-committee. I have earned Registered Nurse, Bachelors Degree in Nursing and Masters of Science in Human Resources Management, and had fulfilled many nursing roles at Health Services Authority over a 23 &1/2 year of employment there. I am currently serving as the Registrar for the Health Practice Councils in the Cayman Islands and Deputy Director for the Department of Health Regulatory Services.